What’s a girl to do when she’s still stuck between men? Make pro-and-con lists, buy a new couture suit, dash off to Vegas and join a high-stakes poker game — everything’s on the table in Crazy Ex-Girlfriend’s antepenultimate episode. Perhaps in recognition that the end is nigh, it’s one of the daffiest, laugh-out-loud funniest, and most musical outings the show’s done in ages, cheerfully flitting through half a dozen storylines without losing sight of the big one: Rebecca’s choice of a boyfriend. As Rebecca notes when she draws up her Darryl-endorsed columns, a key feature of all three suitors is that they are now, like her, “evolved.” (They’re also all “dynamite in the sack,” a qualification for which Rebecca claims some responsibility.) As the show has slowly nudged Greg, Josh, and Nathaniel into higher and higher levels of desirability, I’m surprised to find I no longer have any rooting interest among the trio. Others might feel differently, but I appreciate that the character work over the past two seasons has gotten us to a point at which Rebecca’s quandary feels genuine. Picking one of the guys really does mean losing out on aspects of her personality that the others bolster. Earlier in the season, Paula noted that Rebecca’s ongoing enmity with Audra was a loose thread in her story. I’m not sure I feel the same way — sometimes loose threads in life just don’t get tied into a bow, especially if they’re part of a 20-year-old tapestry woven from animosity. 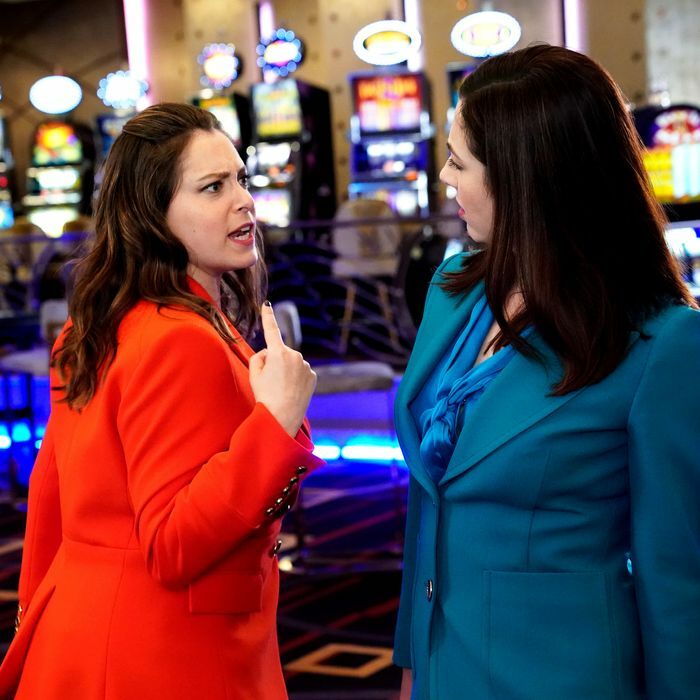 But if it really felt necessary to call a truce in Rebecca and Audra’s “JAP Battle,” I think this is about as strong a wrap-up as we could have hoped for. It makes sense that Audra would admire Rebecca’s daring escape from their high-pressure upbringing, and the “grass is always greener” reminder that Rebecca’s life might look fun and free-spirited to a married corporate lawyer with triplets is clever. Their compliment rap battle doesn’t hit the comic heights of the first one — the mid-song pause to pre-apologize to Twitter was beyond unnecessary, and better dispensed with in the original by a few well-placed jokes — but it still has some pretty choice lines. The main point of the Audra storyline is really to provide a last hurrah for the #girlgroup4evah, which is likely to be shunted to the sidelines for the other big trio in Rebecca’s life. It leaves them all in imperfect but generally satisfying places. Valencia decides she doesn’t want to be like marriage-crazed Denise, and drops the wedding ultimatum with Beth. Heather is still saddled with the antics of ever-irresponsible Hector, but she does manage to make him assume a little accountability. And Paula has found her place at a diverse, hyperprofessional law firm, where she might even teach the staff a few things about Dress Barn. The question now turns to what satisfaction looks like for Rebecca, and for the two (or possibly all three!) men she doesn’t pick. To a puzzled WhiJo’s eternal chagrin, Josh, Nathaniel, and Greg are all-in on her, nudging each other to “stand down” even after they see Rebecca’s damning pro-con list. Their solution (and likely the entire next episode) is a Dating Around of exes, with Rebecca going out for an evening with each before making her pick. Will dialing down this romantic crisis to “Slow Motion” be the solution, or is it only likely to reveal more problems? All we can really know: The Columns Wait For No One™.